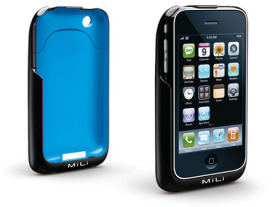 MILI-the accessory maker announces the release of two novelties for the iPhone users. The first called Power skin is external battery case which is supposed to be the tinniest in the iPhones history. It has 1200 mAh lithium-polymer battery which adds extra time between charges, 230 hours of standby, 3.9 hours of 3G talk, 3.9 hours of 3G Web surfing, 19 hours of audio playback, or 5.4 hours of video-playback time and is comparable with iPhone 3G and 3GS. 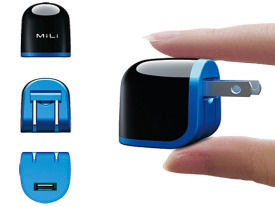 The second called PocketPal is smallest USB charger with ability to charge iPod, Mp3 players and mobile phones but unable for iPad. Additionally, PocketPal is foldable and easy to use. Both accessories are available in eight different two-tone combinations: black, white, blue, green, orange and etc. Price of Power Skin is $70 (USD) and PocketPal is for $20 (USD). Both devices sell at discounted price for $80 (USD). Accessories will be available from U.S. distributors soon.